Amitriptyline hydrochloride is used to treat mental/mood problems such as depression – it is a tricyclic antidepressant. It may help improve mood and feelings of well-being, relieve anxiety and tension, help you sleep better and increase your energy level. It works by affecting the balance of certain chemicals, such as serotonin, in the brain. The first tricyclic antidepressant discovered was imipramine, which was discovered accidentally in a search for a new antipsychotic in the late 1950s. Hafliger and Schinder, in 1951 US, replaced the sulfur bridge of the phenothiazine ring of promethazine with an ethylene bridge to synthesize imipramine, a weak antihistaminic and mild anticholinergic with sedative properties in normal human volunteers. Kuhn, a clinical psychiatrist in Swiss psychiatric hospital, discovered that of some 500 patients with various psychiatric disorders that were treated, only those with endogenous depression with mental and motor retardation showed a remarkable improvement after about 1 to 6 weeks of daily imipramine therapy. Thus, the first clinically useful tricyclic antidepressant was discovered. It did not take long for the diamine structure of an additional N-CH2 group in imipramine to be substituted with a C=CH group in amitriptyline. Amitriptyline was another tricyclic antidepressant which soon became widely used clinically. Amitriptyline hydrochloride was discovered in 1960 and approved by the US Food and Drug Administration in 1961. 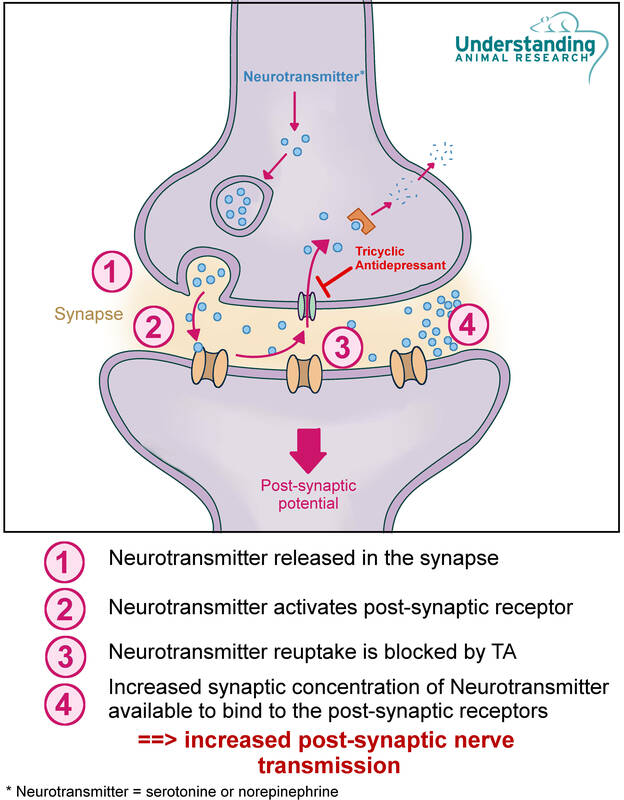 Amitriptyline acts primarily as a serotonin-norepinephrine re-uptake inhibitor. It has a dual mechanism of action and inhibits both serotonin and norepinephrine re-uptake so that more of these compounds stay in the lumen between neurons and stay active. This counters the insufficiency of norepinephrine and serotonin connected to depression. It may also be used to treat nerve pain (peripheral neuropathy, postherpetic neuralgia), eating disorders, other mental/mood problems (anxiety, panic disorder, attention deficit hyperactivity disorder, bipolar disorder) or prevent migraine headaches.